What to Look for When Buying a Dog Door? Through the Door or Through the Wall? Does It Add to Your Energy Bill? Dog doors are windows of freedom for your pup. To keep them from charging out whenever they can, these doors are your last security defense. Making sure your dog door is secure so nothing and no one can get in is also something to consider. If your pup is trained to go potty outdoors, then a doggy door makes your life that much easier, no longer do you have to be your pooch’s personal doorman. 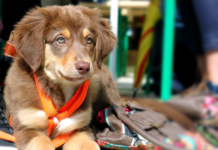 Whether you are at home or not, your pup may step in and out of the house at leisure. Make sure that your yard is well closed off though! 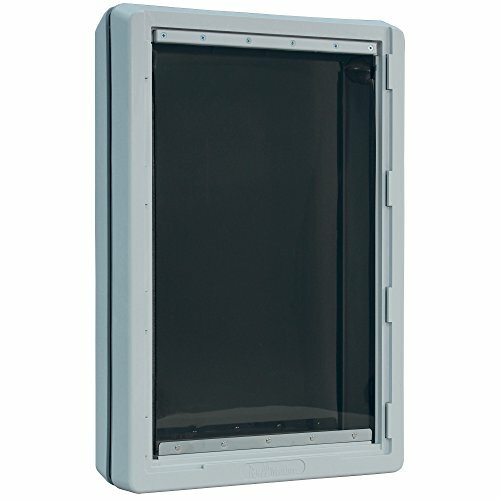 Dog doors are now extremely advanced with aluminum options to electronic to wall mount options. 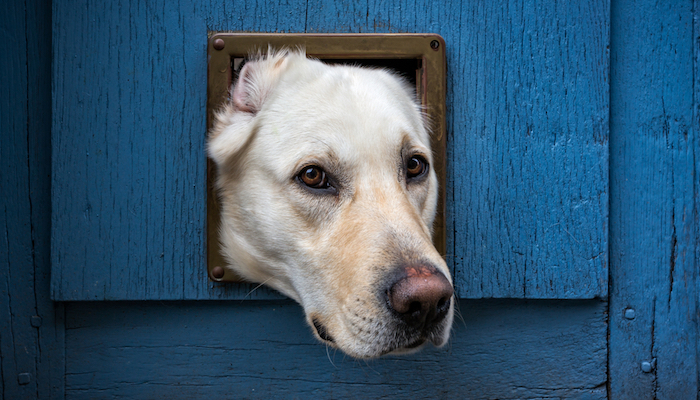 If these terms are confusing, read on as we get into the details of which doggy door would be the best for you. Related: Best Doormats for Dogs in Review. Here we have an option that is extremely weather efficient. We don’t want a door that costs us a lot of energy from the house by releasing heat from inside the house or isn’t insulated well. When there’s a snowstorm or just stormy weather, we want this door to be able to withstand such climates like the rest of the house. This door has a center-insulated flap that keeps the regulated temperature of the indoors. 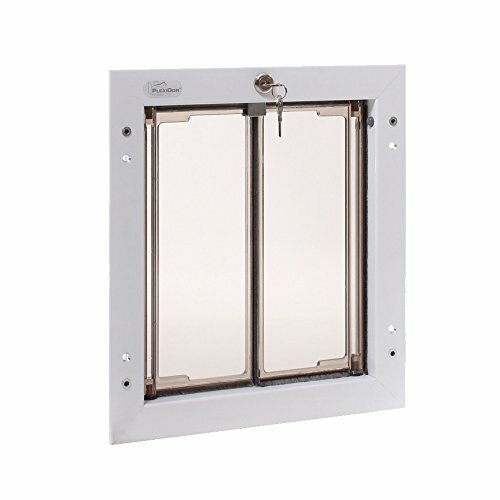 It has the highest energy efficiency of any pet door. With easy installation steps and a paintable plastic frame, so you can match your door to your abode, you can’t go wrong with this choice. Why We Like It – When you don’t want your pet to have access to the outside, there is a snap-on closing panel you can install into the doggy door that’s sold separately. This door seems so technical just by the name alone. The inner telescoping frame adapts to the main door. Also energy-efficient, this door uses vinyl flaps for maximum insulation. Another easily installed option, it’s extremely secure with a wall kit also available but sold separately. 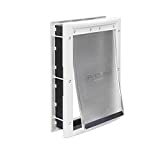 The structural foam molded plastic frame is very durable and energy efficient as well. Suitable for dogs up to 120 lbs, be aware the flap size does not equate the frame size. The frame size measures larger than the flap size. If you have any questions, you can email their customer care specialists 7 days a week! Why We Like It – The cost of energy skyrockets no matter which part of the world you live in. 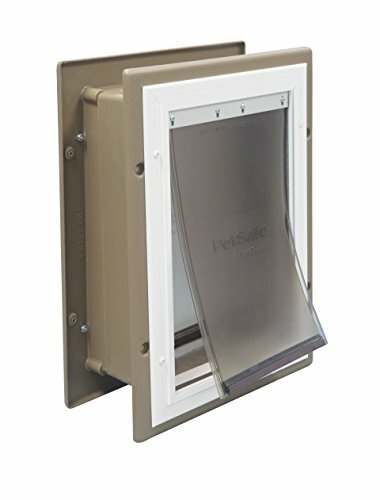 With the soft vinyl flaps, this doggy door is your ultimate energy insulator. A wall mount door gives you the additional option of mounting this door in the wall. The Endura Flap Pet Door also saves on heating and air conditioning bills with their award-winning, energy-efficient door. These doors are magnetic on three sides that seal the door completely and withstand winds up to 50 mph. The aluminum door tunnel is durable and made to fit walls up to 8 inches thick! It’s easy to install as well and is backed by a 15- year warranty! If you have a smaller pooch also wanting to use the big doggy door with your larger dog, there are adjustable magnets to help it push through! Why We Like It – The door comes in many sizes. If you have a larger dog you need to go with the larger size, but that doesn’t exclude your smaller pooch from using the door with their adjustable magnets. 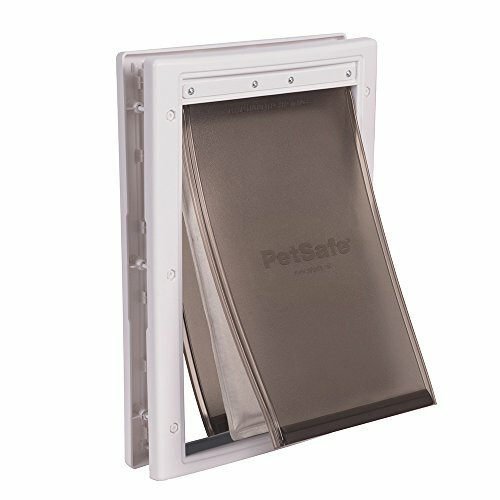 The frame of the PetSafe Wall Entry Door is very durable with a plastic telescoping tunnel that fits the wall’s thickness. 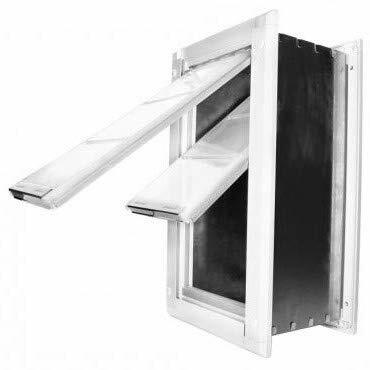 The double flaps are replaceable from daily wear and tear and are energy efficient as well, by keeping out the weather. You may also control your pet’s access to the door through a slide-in closing panel, which also provides added insulation. The easy DIY installation allows the door to fit into all types of walls including stucco and brick. Still having trouble with the door? The customer care experts are available to you through a 1-800 number from Monday through Saturday. Why We Liked It – The wall doors allow your pet to have door access separate from your main door. The telescoping feature makes this door a better fit for walls of different widths. Here we have our first electronic pet door option. 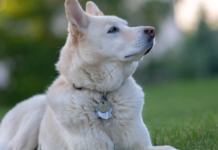 The motor driven vertical sliding door is activated by an ultrasonic collar your pet would wear. The sensors trigger your pet’s direct approach. The door won’t open every time your pet wanders by or is close to the door. The 4-way access control lets you keep a close guard on your dog with 4 options from only in, only out, full access or closed & locked. This amazing safety feature also ensures your home is safe from outside creatures. Other than these amazing functions, the door is also weatherproof with an airtight seal. You can expect higher security from this door compared to any other! Why We Like It – This door really has it all! You get what you pay for as this door has an added safety feature. The door panel automatically raises, should it sense any obstruction on the way down. This door also has a customizable frame, which you can paint any color your heart desires. The flaps and the door itself are flexible and easy to install. The flexibility does not get in the way of security, as a snap-on closing panel can keep your pet from using the door by closing off the opening. Not only does this door come with an installation manual, but a cutting template and installation hardware are included too! 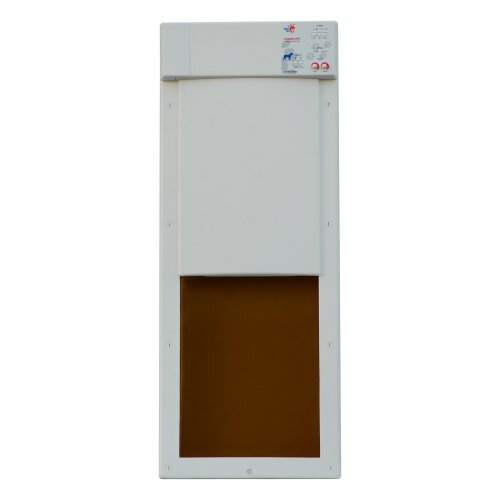 This PetSafe option is a low maintenance door intended for single pet homes and moderate use. Just install it into your people door and you’re good to go! Why We Like It – This door gives your pet the freedom to roam while the soft tinted panels are designed to keep out drafts. Don’t worry about some unwanted animal friends coming in to spend the night, they can’t get in! This door option is very aesthetically pleasing if I do say so myself. With its super sleek design, this door fits perfectly with sliding glass patio doors. What makes this an even greater design is it’s portable, just take the door when you leave, perfect for rentals! The tinted and flexible flap uses magnets to keep the flap in place. It’s also lined with weather stripping to keep the heat and cold outside. Since the doggy door is used with glass doors, the frame needs to be strong. 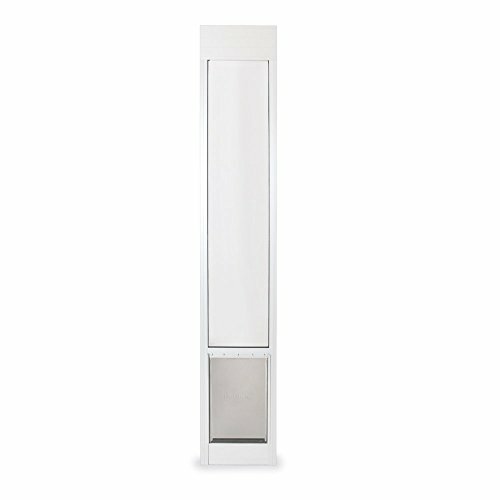 Made with an aluminum frame with tempered glass, this door can withstand everyday use. 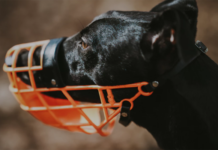 Why We Like It – With this option, your dog can come and go freely, and if by chance you need to move or use a different human door, simply remove the doggy door and reinstall! If properly installed, doggy doors can help save as much as 10% off your energy bill! Think of it as a long-term energy-saving investment. This versatile door can be installed into a multitude of doors, from wood or steel to glass. Being made in America, it adds an extra guarantee for the quality of the door and with a 10-year manufacturer warranty. It really puts your mind at ease. Who doesn’t like a free gift? Each door purchase comes with a free Extreme Dog Fence Pet Grooming and Massaging Glove! Why We Like It – Glass doors and windows can put pet parents on edge. 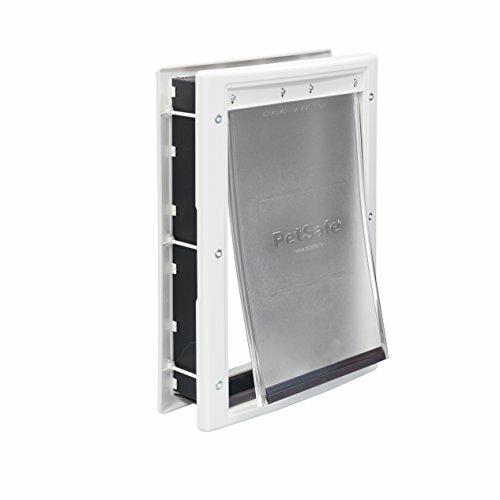 This Plexidor Dog Door is made with shatter-resistant panels and heavy-duty aluminum frames. Fear not! Your pup will be safe. Another electronic pet door, it only unlocks upon scanning your pet’s existing microchip, or a SureFlap RFID collar tag (one tag supplied with every door). This can effectively prevent intruders from entering. A lot of the consumers bought this door for the curfew mode. This is a program that sets the door to lock and unlock at specified times. You need 4 C cell batteries (not included) to get this door working, but it should last up to a year with normal use. This door is great for cats or smaller breed pups as it is quite small in size. Why We Like It – This door reinforces training with the curfew mode. 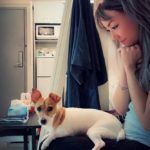 You can train your pet to only leave the house at certain times, and not when you’re out of the house. It looks simple, but it sure does its job! The unique two-way design has a clear acrylic chew-proof panel screwed into an aluminum frame. The spring hinges are durable and resistant to the swinging motion of the door. Even though it’s a hinge design, this heavy-duty dog door is still weather-tight and energy efficient. Gun Dog stands behind this product with a lifetime warranty that includes chewing! Whether it’s a defective product or your dog somehow chewed through the panel, Gun Dog has got your back! Why We Like It – Extremely easy to install and trim around, the door looks very sleek and professional. If installed correctly, the door seals very well! Pet doors are becoming more and more advanced, integrating technology and smart functions into our households. We use our doors to only allow access to certain individuals and keep our homes safe. Why not the doggy door too? Pet doors are also intended for your pet to have easy access going in and out of the house while keeping out unwanted animal guests. 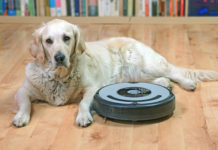 We want to be sure our pets feel like they are part of the family with their own versions of household items and features. Read on to learn about how to pick the right door for you and your pooch. The size of the door is in direct connection to the size of your pooch. No matter how much you like the design of a smaller door, it simply won’t fit your Saint Bernard through, so don’t even try. Make sure you measure your dog and find the right fit. Ideally, the height of the opening should be at least 2 inches higher than your dog’s shoulders. As animal lovers, sometimes we have more than one furbaby at home. The doorframe should be measured to fit your tallest and largest pooch. 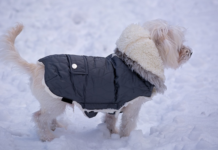 The best fit for your dog width-wise would also be two or more inches wider than it. For those of you with puppies with the potential to grow exponentially, make sure you find the right door to accommodate their full size. If you read through our list thoroughly, you would have seen a few electronic options. One of which has the function of scanning your already embedded microchip in your pup. This should be your first choice if your pooch already has a microchip. This takes away the hassle of having to put a collar on your dog all the time in the house. There are also ultrasonic and magnetic options that work well too. There are two basic designs, a doggy door through the wall or through a human door. The ones that are installed into doors are easier to accomplish. As you can imagine, installing such a door into your wall takes an enormous amount of effort. If you have concrete walls, the task may seem near impossible. Where your door is placed is completely based on preference. What area of the house would you like your dog to enter through? The choices are plastic or metal. For obvious reasons, a metal frame is more durable than a plastic one. If your dog is a larger breed or a full-fledged furniture destroyer, a heavy-duty metal frame could be better. However, for a tiny pooch, a plastic door will suffice. A doggy door is essentially a hole in the side of your house. Such a hole can be tough to regulate. It’s hard to prevent against intruders, and difficult to keep your home cool in the summer and warm in the winter. Make sure the doggy door is weatherproof first of all, and above all else, properly sealed to protect your house against unwanted factors. Make sure the door and your house are well protected against the elements. It’s better if this process is done in pairs. Find someone in your family who can assist you. 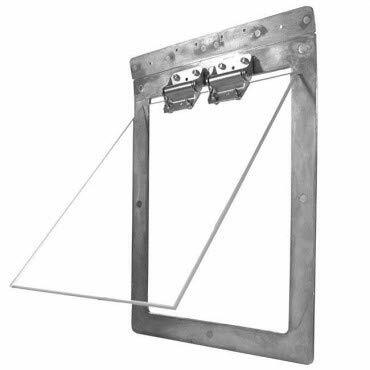 Have one of you be on each side of the doggy door with the panel/flap in a fully open position. Have lots of your pup’s favorite treat ready and reward him/her when they hustle through the door when you and your family member call its name. Repeat as necessary and gradually lower the flap little by little each time, until it is eventually fully closed. Your dog will catch on to the idea in no time. Remember that this is also a slow process and requires patience. Keep at it! Your pooch can do it! This door comes in two sizes, a medium and a large. The large accommodates pets up to 100 pounds! With all the electronic safety features and its ease of use, this is a great fit for larger dogs! You don’t want your large baby having to struggle through small doorframes and potentially damage your door or wall. Made almost exclusively for small dogs, this is the perfect little door that only authorizes certain dogs to enter your home. There are different modes you can set it on (only out, only in, lock) to ensure your little canine tot doesn’t slip out unnoticed. In my honest opinion, I’d opt for an electronic door for my pet. The installation and the setup could require more time and effort, but it’s worth it in the end with the convenience it brings. The two options we suggested for large and small dogs are the best choices. I’d personally lean towards the High Tech one for all its features and it’s user-friendly for large and small dogs. The directional ultrasonic sensors and 4-way access control speak for themselves. Not totally sold on the security? The metal deadbolt lock is impossible to force open. And if all those characteristics don’t convince you, this one will. There is an automatic retract function if the door senses something obstructing the opening, like your pup taking its sweet time crossing the threshold. On top of that, this has the best weather insulation out of all pet doors. Made for extreme climates, this door will fully protect your home from the harsh weather outside. 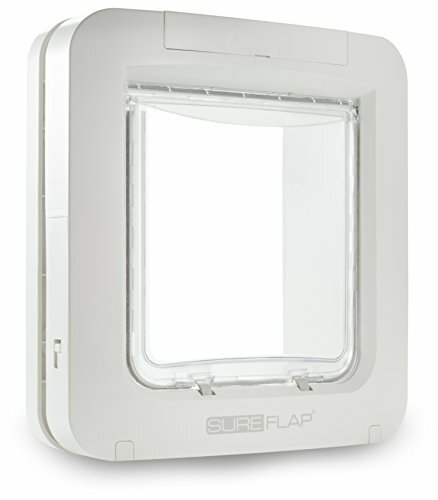 The 3-flap system offers maximum protection against the elements, with 3.5 times higher efficiency than the average door. Keep your home warm while still giving your pet the freedom to come and go. That was a lot of information to swallow, but if you follow our tips, the right door is just a click of a mouse away. A good doggy door should empower your pup and make it feel even more at home with the freedom to come and go. Training your other pets to use the door is also easy with lots of reinforcement and treats! Most pet mommies and daddies out there can agree that dog doors have made their lives and the lives of their pets easier. We hope with our help, you will also come to feel this way. One more thing, make sure the door you choose depends more on the features and safety functions rather than the price. The safety of our home and our pooch are priceless! Patience is a virtue when training any pet. Aside from that, you also need consistency. Stay consistent in your training methods and do not deviate from the plan. Your choice of pet door should also be consistent. A lot of options have a money-back guarantee, look for these ones when you are trying to find the right fit. Chances are, your dog will like one type more than another. Once you find their preference, stick with it and keep at it. A really cute and factual thing is that if you have multiple pets, the first trained one will most likely demonstrate and take it upon itself to teach the others. This will be an incredibly adorable process to watch.